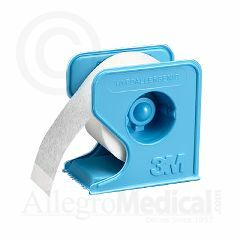 Allegro Medical offers a wide variety of medical tapes for sale at wholesale prices. Browse our vast inventory of medical paper tapes, paper surgical tape, hypoallergenic paper tape, and much more from the brands the medical profession trusts the most. Browse our inventory of top medical tape products from trusted brands such as Curad, Micropore, Tenderskin and many more. AllegroMedical.com offers only the highest quality wound care products, medical tape supplies and accessories at the lowest prices guaranteed. See our Best Price Guarantee for more details. See our Best Price Guarantee for more details. Tenderskin Hypoallergenic Paper Tape - 1/2"